Today marks the three week mark. And the recovery continues...slooooooowly. Yesterday I got the go-ahead to walk around without crutches as tolerated. I almost made it all day today. Mind you, I was just lying around the house but the general things around the house I could do while gimping around. Hip extension has become my nemesis. But I have been lying more so as to stretch the anterior hip capsule in hopes of alleviating the tightness and to help with walking. 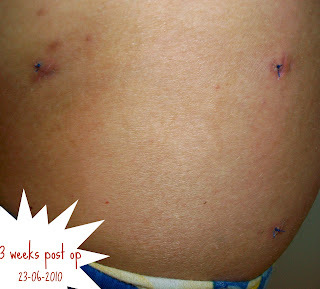 I still have my stitches and called my family doctor to make an appointment to get them removed. 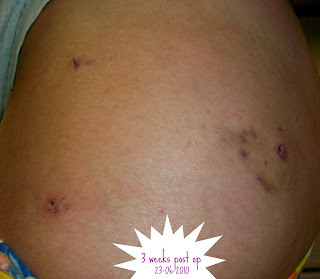 They are quite annoying and I know that they will heal quickly once the 'dissolvable' stitches are removed. I was quite surprised as to how quickly I could get an appointment with my family doctor! Usually it takes a couple of days, but the receptionist said that three weeks is a bit long to have stitches in and that they must be quite uncomfortable and made an appointment for tomorrow at whatever time I wished. It is nice to catch a break in the scheduling of appointments (since I have been canceled upon and shafted more than once in my hip journey.) So tomorrow....OUT THEY COME! Here is what the hip looks like at the moment. 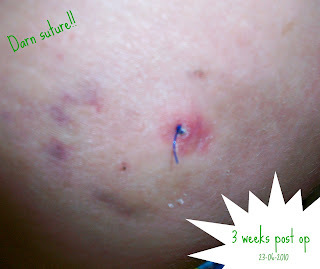 I will post pictures once the sutures are removed. They look a bit red and inflamed. You will do better with them out. Walking a bit fab! It is a long long journey and the body is screaming what the hell as happened here. I can see it is an adjustment on alot more muscles as the compensation on others has been great. I am five and a half weeks and can walk some days a bit limping others ok but still can't sit on a chair for long. Still not depressed yet just glad I am not at work I don't think getting over this and coping with work is a good mix. One thing at a time. Keep up the exercises and walking well done. Glad to hear that you are taking it easy. Slow and steady wins the race. (Although it is difficult to remember this when all we want is to function normally again.) Keep up the good work!